Great little community!submitted by Robert B. - Jul 11, 2014 |Recommended: YesWe found our new by accident but we are really happy here. We had to downsize due to one of us being in school full time but Lisa, Tara and Matthew have taken great care of us! THE STAFF IS GREAT! !submitted by Takenya C. - Jul 04, 2014 |Recommended: YesIt's not bad living here, the community is pretty quiet and laid back and if you need anything taken care of maintenance responds pretty quickly. My only negative thing to say is about fixtures, linoleum, etc. The bathroom linoleum is coming up from the floor, the cabinets, walls and other things look painted over to cover up wear and need for repairs. The bathroom sink looks old & is rusting and it looks like paint was used to cover up wear and tear, etc. in the sink. With all that said, the community is good, but the apartment features could use some work, although it's altogether better than my last apartment. Is a nice place to live.submitted by Doreen D. - Jun 20, 2014 |Recommended: YesCourthouse Green is in a good location and has provided a good living experience. Quiet! !submitted by Mary P. - May 28, 2014 |Recommended: YesCountry living in the city! 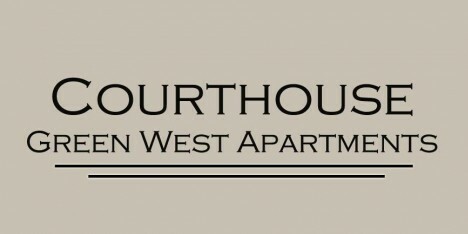 I'm very excited about living here in the Courthouse Green Apartments. I thank you for all that you and your team do for all of your tenant's and myself. submitted by Samuel C. - May 04, 2014 |Recommended: YesFantastic, Wonderful, clean and well maintained. Feels like homesubmitted by Davinna K. - Apr 01, 2014 |Recommended: YesApartments are huge and staff is very friendly. I only wish that I had one of the renovated apartments when I moved in. It is a nice community.submitted by Ann C. - Mar 26, 2014 |Recommended: YesNice. Affordable and a good living environment.submitted by Sharon C. - Mar 03, 2014 |Recommended: YesI like that it's peaceful and quiet most of the time.